William Robertson was a friend of Skinner Prout. 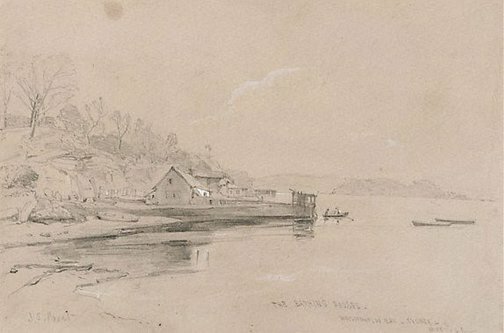 Prout stayed with him at his home 'The Hill' at Colac, Victoria on one of his sketching tours. Robertson was a member of the Victorian Parliament and purchased many of Prout's works from the sale of his estate in London. Some of these Robertson subsequently gave to the Royal Society of Tasmania, now at the Tasmanian Museum and Art Gallery, Hobart. This is one of nineteen drawings by Skinner Prout of NSW subjects in the AGNSW collection, all from William Robertson's collection. It is likely to have been lot 65 or 69 from the auction of 'The remaining works of the late J Skinner Prout' Christie, Manson and Woods, London 26 February 1877. Signed l.l. corner, pencil "J.S. Prout" . Dated l.r. corner, pencil "... MAY 7 - 42.". 19th century Australian watercolours, drawing and pastels from the Gallery's collection , Sydney, 2005, 36, 37 (colour illus. ).